Looking for a Chiropractor in Ipswich? Booval Chiropractic was established in 2008 by Ipswich Chiropractor Dr Scott Charlton. We deliver professional, effective, trusted, quality chiropractic care to thousands of patients in the community. We are here to help. 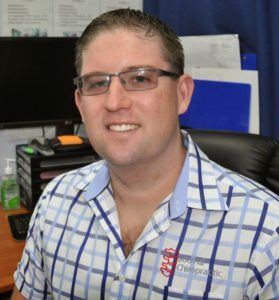 Dr Charlton holds four degrees, including a Bachelor of Laws (1st Class Hons) and Bachelor of Commerce from the University of Queensland, and a Bachelor of Applied Science (Comp Med) and Master of Clinical Chiropractic from RMIT University in Melbourne. He regularly attends a multitude of professional development seminars, conferences and the like both in Australia and internationally to stay current on research and current thinking to best assist his patients. Dr Charlton is a past non-executive director of the Chiropractors’ Association of Australia (National) (now ACA) where he chaired the Tertiary Education and Research Committee and still sits on the Audit and Risk Committee. He is also a past director and president of the Chiropractors’ Association of Australia (QLD). Dr Charlton has been a professional panellist and/or chair of the Performance and Professional Standards Panel of the Chiropractic Board of Australia assisting AHPRA in cases involving Chiropractors since 2010 and has also been a QCAT Health Assessor over the same period. He is a current member of the Accreditation Committee of the Council on Chiropractic Education Australasia (CCEA), an independent and nationally recognised body responsible for ensuring competency and high education standards in chiropractic for the Australasian community. Dr Charlton also provides expert medico-legal opinion in cases involving Chiropractors to both the HCCC in NSW and to AHPRA in various jurisdictions. He is a second generation Chiropractor and one of 6 in his family. Dr Charlton also travels interstate and internationally to represent the association and the profession on the global stage. Recently he had the honour of presenting at both the World Federation of Chiropractic Assembly in Washington DC providing the report for the Pacific region as well as the most influential research conference DC2017 also in Washington where he presented in the Research funding forum. This followed a trip to Shanghai, China in late 2016 again representing the CAA National. He is a member of the organising committee for the Chiropractic part of SpineWeek 2020. Your health is your most important asset. Don’t trust it to just anyone. At Booval Chiropractic you will get a professional, expert opinion and a plain language explanation of your case. We will give you options for your care based on your needs and preferences. We have many different options for treatment and are expert in many Chiropractic techniques and have equipment for spinal rehabilitation that simply isn’t in many clinics in Queensland never mind Ipswich. 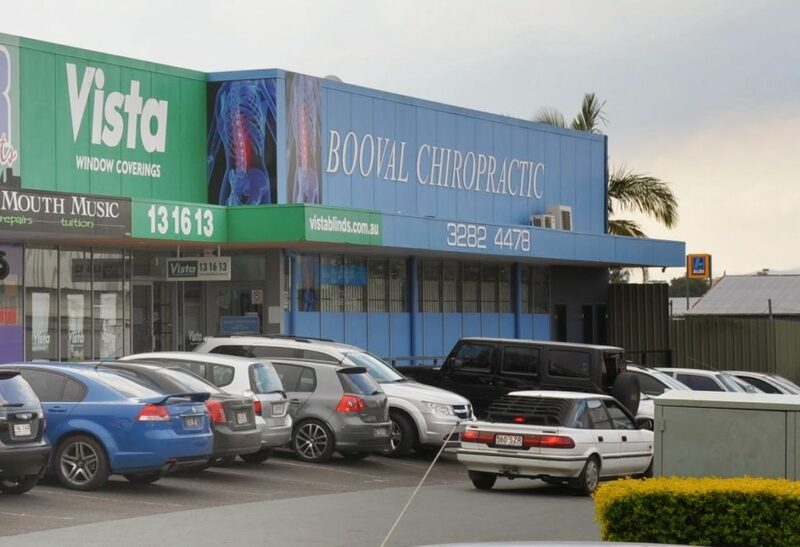 When you arrive at Booval Chiropractic, you will find abundant free car parking and safe, flat access to our chiropractic clinic. When you enter our clinic, you will be greeted by our friendly and professional chiropractic assistants. They will guide you through our patient registration process. You will complete a brief questionnaire to help us capture valuable information about your known pre-existing health conditions. You can download and print the patient forms here to complete before your appointment if you wish. Then you will meet with Dr Charlton for the first time. He will complete your comprehensive health assessment for chiropractic care. Using your information in conjunction with a comprehensive case history and examination, Dr Charlton will guide options to the right chiropractic care for you, and whether Chiropractic care is appropriate in your case. The purpose of your first consultation with Dr Scott is to discuss what troubles you, your health goals, and see if chiropractic care is likely to help you. If chiropractic care is suitable, a thorough examination will assist in determining the cause of your problem. At this point should x-rays or other imaging be considered clinically indicated, we will refer you to a local clinic that doesn’t require appointments for x-ray and usually bulk bills. We will discuss if other types of imaging such as MRI, Ultrasound or the like is clinically appropriate. Please note not all cases require imaging, and this will be assessed and explained case by case. Depending on the case presentation, you may be treated on your first visit (after gaining informed consent), or we may need to wait for results from imaging. If you have previous X-rays, CT or MRI scans, please ensure you bring them to your first visit. Your second visit is what we call your report visit. During this visit, we share your ‘Report of Findings’ and advise what treatments options are available to you (including non-chiropractic alternatives) and their likely risks and outcomes. With a complete study of your health history correlated with examination findings, Dr Scott will recommend the best approach to improve and maintain your health. Depending on your unique situation, Dr Scott will apply his professional judgment in offering you a tailored treatment plan that respects your goals and choices for the best outcome. The duration of your follow-up visits will vary based on the therapy employed in your chiropractic care. Some patients undergoing spinal rehabilitation traction may be with us for 30 to 40 minutes. However, a typical follow-up non-complicated patient visit to our clinic is 5 to 10 minutes. We will discuss the frequency of visits in formulating your chiropractic plan. What happens in follow-up visits? By being comprehensive in his approach in the initial two visits, Dr Scott will have the necessary information at hand to allow him to assess and treat you in a very focused fashion and to provide necessary advice for what you can do outside of the clinic to speed up your progress. At set periods and following any changes in condition, a re-examination and review may be appropriate which requires further time (you will be advised in advance typically, and there is no further cost). Ipswich Chiropractor Dr Scott Charlton is highly skilled, expertly competent and experienced. We know your time is valuable. We want to maximise the benefits of chiropractic care but minimize the impact on your busy schedule. We do our best to run our clinic on time- our goal is to see you within 5 minutes of your appointment time 90%+ of the time. We are open early and late weekdays, and we open Saturday mornings for your convenience.